Dreaming of summer grilling this year? Turn that dream into a reality with an outdoor kitchen. Outdoor kitchens have become wildly popular for two main reasons; they are functional and fun. They take entertaining to another level entirely and open up a whole new world of dinner parties. Functional: Outdoor parties become that much easier when all stages of food prep can be done inside. No more going back and worth, getting footprints all over the house and letting the cool air out. Less time traveling between the indoor kitchen and outdoor party means more time for actually enjoying your party. Stylish: With modern design and ability to customize style to any taste and yard, outdoor kitchens can be downright stylish and add to the aesthetic of your backyard. 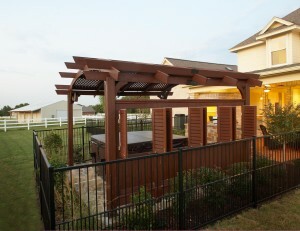 Value: Needless to say, an outdoor kitchen adds value to your home and quite a large wow factor.